Does TV history have ‘news values’? As a history TV doc development bod, every pitch I wrote had to answer 2 questions: “why now?” and “what’s new?” – novelty and topical relevance often played a big role in commissioning. The novelty can sometimes be exaggerated to get the commission, and again to boost ratings. It struck me that this isn’t so dissimilar from some things you find in TV news. And ‘news values’ have been a subject of scholarly inquiry going back to a 1965 study by Johan Galtung and Mari Ruge which I remember reading as an undergrad. This work and the subsequent debate is synthesised in plenty of textbooks (Brighton & Foy’s News Values, from which I paraphrase some of the below, is a decent starting point). Galtung and Ruge focused on newspapers. Their work predates rolling TV news and the internet, but nonetheless the idea that there are ‘news values’ remains compelling. G&R came up with ten key values: relevance, timeliness, simplification (i.e., can it be described in straightforward terms), predictability (could it have been foreseen), unexpectedness, continuity (i.e., it continues an existing story), composition (works for the particular outlet), elite people (celebs), elite nations, negativity (bad news is good news). Later studies (focused on TV) noted the importance of pictures to that medium. The list has been much debated, but I don’t think it’s hard to see how one might use it as a starting point to explore a set of ‘TV history values’ (or indeed a wider set of popular history values). There is certainly an elite of historical personalities whose lives are disproportionately covered, likewise nations. The ‘composition’ value works too: programmes need to fit the outlet’s style. Timeliness produces the demand for novelty: this is all-new research that we need to cover now! Photo by David at Flickr. I realised it was a while since I’d posted an update here. This is a busy teaching term for me, but I have several events coming up, including a couple of talks in London, which are listed on my Events page. I’m particularly looking forward to the first rehearsed reading of a new play on which I’ve been historical advisor. Shakespeare and his Black Mates, by Lynda Burrell and Fran Hajat, is at Nottingham Playhouse on Thursday 2 November, and it’d be great to see people there. In academic life, I’ve been writing for and co-editing a volume on Queenship and Counsel in Early Modern Europe, which is close to completion and I hope will be out in 2018. That (I think) will be the last of my publications relating to the history of diplomacy, and I’ll be turning my attention to sixteenth-century guns for a while (as a research topic, that is). Alongside all that, I’m writing a new non-fiction book for Bodley Head with the working title The Crucible of Europe. This will be my take on the period of the Italian Wars, 1494-1559. There are lots of famous names from these years (Christopher Columbus, Lucrezia Borgia, Leonardo da Vinci, Niccolò Machiavelli, Isabella d’Este, Michelangelo Buonarroti…). This is a book about the world in which they lived, and also–importantly–about lots of other people who you probably haven’t heard of but are just as intriguing. Publication is some way off, though: it’s a big project! And… some of you will know that I’ve been writing a novel. I hope to have more news of what’s happening with that in the New Year. Now to survive Intro Week and evade the pernicious Freshers’ Flu. More Radio 3 Essays: In January you’ll be able to hear some very early findings from my new research project on the history of handguns as part of a Radio 3 Essay series on gun culture. And in March there’s a very new historical departure for me: I’ll be at the Free Thinking Festival in Gateshead with an Essay about my grandparents, who were missionaries in Dhaka and Kolkata from the 1940s to the 60s. This is some way out of my historical comfort zone, but I have done a fair bit of teaching on public perceptions of Britain’s imperial past. A few years into lecturing I’m finding new topics emerging from the teaching side of the job. New research: There will be more research on that handguns project, which focuses on Italy c. 1500-1550, with a first paper at the Renaissance Society of America conference this spring. And some (more) grant applications in the hope of getting funding for the archive research I really need to do to get this up and running in a bigger way. Fingers crossed. I also have a couple of outstanding articles/chapters from previous projects to write up. Fiction: For a while now I’ve been playing at writing a novel that’s a spin-off from The Black Prince of Florence. I’m going to finish it in 2017. I have no idea whether it’ll be publishable quality but the process is raising some interesting methodological issues for me about writing history so at the very least I’m hoping for a theory article. Lectures: Besides those for my students, I have public lectures coming up at the British School at Rome (January), in Swansea (March) and in Leeds (September). I list these on my Talks & Events page, so keep an eye out there for details. Is this an unfeasible workload? I agree it’s an ambitious one. But I’m not planning to finish all the big projects in 2017. And in the past few years I’ve got a lot better at breaking down larger writing tasks into tiny pieces. If I write 200 words a day every day for a year, for example (the equivalent of ten or eleven tweets a day), that’s a full draft (73,000 words) of an academic monograph. And with a 200-word daily target on a project it’s also possible to get ahead of the game by writing more some days, which is psychologically a lot more comforting than setting higher targets and then stressing about getting behind. Academics reading this post may be wondering about how this pattern of work connects to the demands of the REF. One of the consequences of the huge uncertainty about the rules at the moment (to port or not to port, how many outputs per person, will impact be less linked to outputs, etc.) is that it’s basically impossible to plan. So I decided to stop worrying and work on things that interest me, which is probably, to be honest, the best route to turning out good publications. Last week Twitter was very chatty and (in my timeline generally displeased) about an opinion poll suggesting that 44% of Britons think we should be proud of our history of colonialism. As many historians have pointed out, this isn’t exactly a cheering result for anyone who knows about the range of atrocities that happened in the context of Empire, from the Amritsar Massacre to the Bengal Famine (in one part of the red-splattered map) to the enslavement of some millions of Africans (on another). Why, I wondered, would 44% of those polled think the British Empire was something to be proud of? Well, there’s not a lot of critical imperial history in the school curriculum; nor is there on television. (There’s more on slavery, and I suspect a poll that mentioned slavery would get different answers.) Better education is no doubt part of the answer. But I think the problem runs deeper, and that has to do with the weight we place on different sources of information as we arrive at conclusions about what to make of Britain’s imperial past. I’ve been reflecting on attitudes to imperialism in the last couple of months, not particularly because this is part of my research (though I read a lot around early ideas of ‘race’ for my forthcoming book), but because in December 2015 for the first time I went to visit India, where my grandparents were missionaries. I’m interested in how family histories might affect replies to that poll. A lot of popular family history emphasises the idea that we might inherit personality traits and talents from our forebears. Think how many episodes of Who Do You Think You Are? feature a showbiz celebrity excitedly discovering that his/her ancestor also had some musical gift. On the other hand, as the controversy over Ben Affleck’s Roots highlighted, it’s very much harder to accept that your ancestors did the Bad Things. (Slave-owning, in his case.) Because, in the narrative of these shows, that might imply that you also are a person who given half a chance would enslave or exploit. Were it not for the fact that I know quite a lot about history, I suspect that my attitude to Britain’s colonial past would be heavily determined by the fact that my missionary grandparents were very nice people, who despite religious views that I don’t share did lots of valuable educational and welfare work (including on unpopular issues like welcoming migrants to Britain in the late 1960s) and that as very nice people they surely couldn’t have been implicit in any Bad Imperial Things. In fact, most of their mission took place post-Independence, and the interests of missionaries and the Imperial establishment did not always coincide. Still, on a structural level the alleged superiority of Christianity over other belief systems was used to justify all manner of dubious Imperial projects. But if I didn’t know that it would be tempting to draw my conclusions about colonialism on the basis of warm family ties and not much else. If I didn’t have those grandparents, and I’d just taken my holiday to India out of interest, would I have learnt along the way that I shouldn’t be proud of the British Empire? Strangely enough – and this surprised me – I don’t think I would. When I walked around the National Museum in Delhi, or the Indian Museum in Kolkata, I came away with the impression that the ‘British period’ was just one of many periods in Indian history when parts of the continent were ruled by one or other dynasty. Not by any means uniquely bad. I also came away with the impression that most of the kids in the school party visiting the National Museum wanted to shake my hand, say hello in English and pose for a selfie with me. Several parents wanted a snap of me with their kids too. Which didn’t give me the sense of a generalised hostility to the British. Rather the opposite. For sure, a fair number of the people I met in India who were jolly friendly to me had a professional interest in my TripAdvisor rating of their hotel, city tour or restaurant. But these children and families didn’t. When I went to the Victoria Mameorial in Kolkata, an Imperial monument par excellence, it was selfie-central again, Indian visitors posing against the statue of Queen Vic for their Sunday snaps. The massive crowds meant the museum in the monument was hard to engage with but my impression was of light Bengali nationalism and mild criticism of the British for accommodating to local conservatism. I certainly didn’t get the impression it was bluntly anti-imperialist. So if my view of British colonial history had been shaped by my visit to India, and if I wasn’t a historian who tried to think about the complexity of the human past, well, I could easily have come home thinking that in general Indian people really quite like British people and they don’t appear to have an axe to grind against us for the various Bad Stuff. Returning to the poll, if I had nothing else to base my opinion on, both my family history and my experience of public history in India would incline me to the view that (in India at least) the British Empire was just another set of rulers, and that some, perhaps the majority, of the British in India were good people. So why not be proud? Or at least neutral? As an educator, I like to think that better formal education about imperial history might change things, but I’m well aware that family, tourist experience and public history can easily trump anything I say in class. Besides, I’ve seen those TV programmes about the Indian railways. Damn good. Don’t tell me this is an Evil Imperialist Train. I won’t believe it. 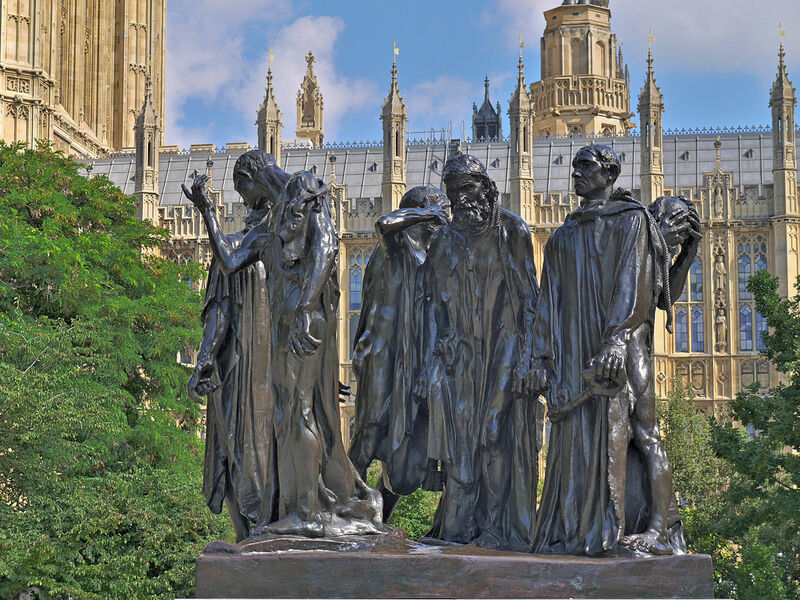 In Victoria Gardens, London, outside the Palace of Westminster, stands a statue of six men: the Burghers of Calais. Unveiled a hundred years ago this summer, it is one of a dozen casts of Rodin’s original in Calais and commemorates a famous incident from the Hundred Years War, recorded by Jean Froissart in his Chronicles. Froissart tells how the army of Edward III, king of England, had laid siege to Calais for almost a year. The French king had advanced to nearby Sangatte, then retreated. Peace efforts had failed. As supplies dwindled, six of Calais’ leading citizens – the so-called burghers or (in French) bourgeois – offered themselves as hostages in return for the lifting of the blockade. The six (Eustache de Saint-Pierre, Jean d’Aire, Jacques de Wissant, Pierre de Wissant, Jean de Fiennes and André d’Ardre) left the town with its keys, expecting to go to their deaths. They were saved thanks to the intervention of Philippa of Hainault, queen of England, who begged the king to show mercy. Reading these past weeks about the desperate attempts of migrants in Calais to reach the UK reminded me of Rodin’s statue and Froissart’s story. Froissart’s story, because at its heart is something that has been badly lacking from most of the political debate on Calais and the ‘migrant crisis’ – mercy. Other people have documented far better than I can the appalling conditions from which the migrants in Calais have fled, and in which they now live. But I have yet to hear a British politician say that mercy is what is needed in the face of such human desperation. It is a sad thing indeed when medieval queens seem to have a better humanitarian instinct than twenty-first century politicos. And I think of Rodin’s statue, well, because it’s in the back garden of the Palace of Westminster. I bet most MPs have done a TV interview within yards of it. Did they ever stop to think about who those starving, almost skeletal people in the statue were? Or what happened to them? Perhaps if they did, they might be a little more inclined to show mercy to people who are desperate enough to risk death. Image by Patche99z used under a CC-BY-SA-3.0 licence.